The super El Niño of 1998 made obvious to researchers of how natural climate phenomenons can generate huge changes that are felt for years. Using an average of each year's monthly temperature anomalies (satellite measured), the adjacent chart's columns depict the huge shift in global temperatures from the prior 1998 level to the post-1998 level. According to the state-of-the-art technology used by climate scientists, global warming has been unequaled since this 1998 natural event. The only year that came close to the 1998 global temperature was 2010. Although no single year has yet bested the 1998 temp record, the 16-year average after 1998 (including 2014) is significantly higher than the 16-year period prior. Natural climate change dramatically shifted global temperatures up, and they have not returned to the previous average level. Instead, the annual global temperatures since 1998 have shown considerable variation, but do not reflect a pattern of temperature climate change shift - a shift only delivered by a natual phenomenon (like a super El Niño). In fact, the much researched 'Hiatus', which has existed for the last 15+ years, corroborates the lack of any impactful climate change since 1998. As all scientists concur, the El Nino/La Nina climate oscillations take place without any human intervention or influence. Their frequency and intensity are a result of the chaotic climate system that makes it impossible for "experts" and computer models to accurately predict. Yet, when a 'big one' does occur the implications worldwide are enormous. The overall billions spent on satellite technology has resulted in scientists being able to not only monitor these climate-significant ENSO events, the sophisticated technology has also proven to be the best means to measure the world's climate temperatures, 24/7, across the entire globe (99.6%) on a daily basis. One way to assess the superb and spectacular satellite coverage is to envision over 127 million thermometers placed on the globe constantly taking temperature readings. In contrast, the traditional/conventional means of measuring temperatures by NOAA/NASA/UKMetOffice rely on less than 5,000 thermometers, each one supposedly recording temperature changes for a land area equal to the size of Spain. So how does that old, traditional method work in order to determine a global temperature then? Essentially, they measure temperatures in a given specific location then use that sparse information combined with formulas to guesstimate temperatures in nearby regions. Well, that's not too precise and is fraught with errors/biases that have to be constantly adjusted for. That's why it takes several weeks of number crunching and "adjusting" after the satellites have already reported their gold-standard global measurements. For a good write-up on the difference between the state-of-the-art measurement technology and the old, conventional means, go here. In the meantime, major climate change seems to be in a stalled status until the next major natural phenomenon takes place. Note: Excel used with this dataset to calculate then plot year averages. Embracing the hated natural climate change reality. The UK Met Office's mission over the last decade has been primarily to push their beloved IPCC's global warming agenda, besides producing dawg-awful weather forecasting for the Brits. As stalwart jihadists of the anti-CO2 religion, it must be particularly galling that they have to admit that any extreme/severe weather events are the result of natural variation, not CO2. Read here. The IPCC's catastrophic anthropogenic global warming (CAGW) alarmists have long predicted that increasing CO2 levels will directly cause global warming to reach anywhere from 3 to 10 degrees Celsius higher in the near future. In essence the world's maximum temperatures are being exclusively driven to dangerous heights by CO2. But is that actually happening? The most recent empirical evidence clearly indicates that CO2 levels are not driving the average atmospheric, global and/or ocean temperatures dangerously higher. And now comes an analysis of the BEST temperature dataset, which confirms the weak driving force that CO2 appears to be. This graph has monthly atmospheric CO2 levels superimposed onto plots of the BEST maximum temperatures for the U.S. and a solar activity proxy (i.e. Total Solar Irradiance). The blue maximum temperature plot is in sync (up and down) with the red solar activity curve. Obviously, the ever incessant rise of CO2 levels is not in sync with the up and down movements of temperature variation. 1. Solar activity is 'best' at explaining an increase in maximum global temperatures and the related variation of global temperatures. 2. CO2 levels explain little of the amplitude of maximum temperatures and are exceptionally lame at explaining monthly variation of global temperatures. Additional modern-temperature and solar-cosmic charts. This chart is a plot of global "warming" as represented by the red curve (a 5th order fitted trend) and the grey curve for CO2 levels (a 5th order fit). As the red curve indicates, global temperatures started sliding lower during the early 2000's. The highly variable thin blue line is a plot of global cloud coverage from this source with the following change: the blue curve has been inverted. The result being that when the blue curve goes up, that indicates a smaller cloud coverage; when the blue curve goes down, that means the cloud coverage is increasing. As this chart clearly depicts, when cloud coverage decreases, allowing more solar energy to reach the surface, the global temperatures climb (note the 1980-1990's period). In addition, the warming stopped and started to slide lower when the cloud coverage increased after the 1990s - apparently, small changes in cloud coverage are quite powerful in terms of subsequent temperature trends. Obviously, there is a significant relationship between clouds and temperatures. Just as obviously, the relationship between CO2 and global temperatures (and clouds) is from weak to lame, at best - confirming evidence here. The physics is not difficult to understand by skeptics, nor objective scientists: less clouds allow more sunshine to strike the Earth's surface (1980-1990s); more clouds decrease sunshine at surface (2000s). #1: Evidence indicates a strong relationship between clouds and global temperatures. #3. Evidence indicates a weak relationship between CO2 levels and global cloud coverage. #4. Clouds are so important to global temperatures, crazed alarmist billionaires are investing huge amounts to manufacture anti-warming, floating cloud machines. #5. The IPCC climate models are programmed to predict the opposite of what objective scientists believe due to the above actual evidence, and what crazy billionaires know (and will invest) due to common sense. Additional peer reviewed postings and modern temperature charts. 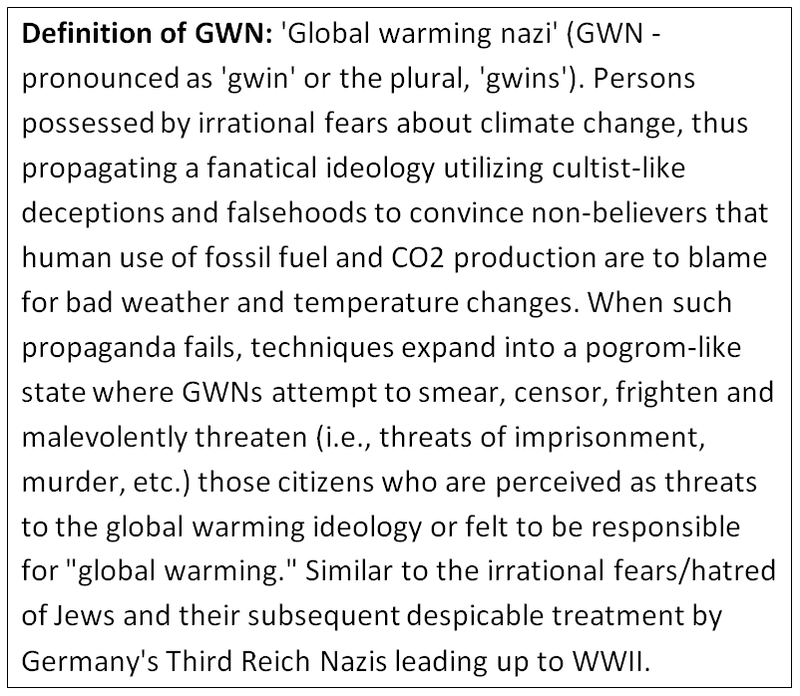 ...and finally, global warming skeptics believe, for a multitude of reasons, human errors/mistakes/failings have caused late 20th century global warming to be significantly overstated. This article addresses this last point. What if the climate experts conducted an actual experiment that would prove whether the global warming skeptics were right or wrong about world-wide warming being overstated? Well, NOAA has actually conducted said experiment by building their U.S. Climate Reference Network (USCRN), which precisely, and automatically, measures temperature and weather conditions across the U.S. The USCRN effort is based on the concept that the best way to measure the impact of greenhouse gases on global temperatures is to place state-of-the-art climate stations in pristine rural areas that are little impacted by people, buildings, vehicles, equipment, asphalt and etc. An example of one of NOAA's pristine climate measurement stations is the top image (Image #1). And the middle image depicts the location of each pristine station - there are currently 114 of them, and clearly they are well dispersed providing good U.S. coverage. There are no observer or transcription errors to correct. There is no time of observation bias, nor need for correction of it. There are no needs for bias adjustments for equipment types since all equipment is identical. There are no need for urbanization adjustments, since all stations are rural and well sited. There are no regular sensor errors due to air aspiration and triple redundant lab grade sensors. Any errors detected in one sensor are identified and managed by two others, ensuring quality data. Due to the near perfect geospatial distribution of stations in the USA, there isn’t a need for gridding to get a national average temperature. So, what has this NOAA experiment found? The bottom image (Image #3) tells that story - when compared to measurements from the old, inaccurate, non-pristine network, temperature "warming" in the U.S. is being overstated anywhere from +0.5°C on average, up to almost +4.0°C (+0.9°F to +7.2°F) in some locations during the summer months. To clarify, this range of overstatement depends on the given new and old stations being compared. However, when the new network versus old network results are examined in total, for the recent summer heat wave in the U.S., the old stations were reporting bogus warming during July that amounted to some +2.1°F higher than the actual temperatures. What does this mean? Within the climate science realm, the old climate/weather station system had long been considered the best and most complete measurement network in the world. But when pitted against a brand new climate measurement system that has the best qualities that science can provide, we find that the traditional U.S. methodology is significantly overstating the "global warming" phenomenon. This means that if other countries replaced their own low quality network with NOAA's greatest and latest technology, with the best location site standards applied, we would discover that world-wide temperature increases have been wildly overstated also. Conclusions: A large-scale NOAA experiment has proven that global warming skeptics were correct: temperature warming in the U.S. has been significantly overstated in recent decades. This NOAA experiment should be expanded to other continents and countries since it is now obvious that the combined older technology and substandard weather station sites have well overstated the global warming phenomenon. Before any further dollars are spent on climate change adaptation and/or mitigation, the world needs to upgrade their global weather/climate reporting network to the USCRN standard so that policymakers have correct temperature change mesurements to base their decisions on. Modern, regional, historical and fabricating-fake temperature charts. Read here. As has been clearly demonstrated with empirical evidence, recent global warming (or lack of) is not the result of increasing atmospheric CO2 levels. So, if CO2 is not the principal driver of global temperature changes, then what is? The adjacent chart is a plot of daytime high temperatures and solar radiation. The very visible close relationship between solar energy and the maximum temperatures is very obvious, and is irrefutable - it's the sun, stupid! With most scientists now recognizing that the jihad against CO2 emissions was not really supportable by the empirical evidence, new scientific efforts are being conducted to determine what are the major factors influencing global warming/cooling. And, the solar influence now appears to be the major culprit. In the realm of the political climate, both Romney and Ryan should be constantly bashing Obama and the Democrats over their destruction of the coal industry, and the anti-science green, fanatic jihad unleashed on the American economy. Driving the coal industry to bankruptcy and curtailing oil drilling across the U.S. was a completely needless hatchet attack on economic growth by Obama's EPA. Read here. As early as 2000, NASA had discovered that the real causes of the prior rapid global warming were a result of non-CO2 pollutants. The NASA team that made this discovery was led by none other than the famous James Hansen, the patron saint of 'wrong-way' AGW on the left here. Subsequent to those findings (btw, did we mention... ahem...the study was published by the National Academy of Sciences? ), these scientists then discovered that the real money (funding, grants, perpetual salaries etc.) could be found by focusing on human CO2 emissions instead. Thus, this NASA paper was quietly forgotten about. The connect-the-dots, global-warming-is-money-paradigm helps explain why climate doomsday scientists keep perpetrating such scientific atrocities as Fakegate and Climategate. Read here. Climate alarmist scientists speculated that global warming from human CO2 emissions would somehow cause the El Niño/La Niña climate cycle to become stuck in the El Niño mode. This would be the proverbial "tipping point" potentially causing the infamous runaway warming. Unfortunately for the alarmists, and fortunately for the rest of us, Earth's systems primarily operates in a negative feedback fashion, preventing runaway situations. In addition, Davies et al. confirmed that during past warming periods, ENSO did not become stuck in the El Nino mode. Conclusion: Global warming science facts - the fear-mongering speculation that modern global warming would initiate a permanent El Niño 'tipping point' is without empirical merit. The ENSO climate pattern will retain its variability, unchanged by human CO2 emissions. After 20 Years, An IPCC Admission of Failure: What Do You Know About Global Warming? Read here. Most people, having even an ounce of common sense, would correctly conclude that paving over agricultural lands with asphalt or that destroying forests to plant bio-fuel crops would have a major influence on temperatures. Amazingly, for the past 20 years, the IPCC has claimed that changes in such 'land-use' had little impact. The IPCC and its closely controlled peer review journals have now admitted that land-use changes do indeed have a major impact on climate change and local/regional and even global temperatures. The IPCC will now include land-use changes as a major forcing in its "climate bible" assessments. Honestly, is it any wonder the IPCC's climate models have been abysmally bad over the last 20 years at predicting global temperatures when such an obviously idiotic failure is finally admitted to? "There is an article in the March 15 2012 issue of Nature that finally elevates land use change to its proper level as a first order climate forcing. While the article still does not recognize that land conversion, particularly in the low latitudes but also in the boreal forest regions continues and, therefore, will add further to how humans are altering the climate, it is an important step for the IPCC to finally make. In 1995 I resigned from the IPCC after efforts to get them to mention this issue were rebuffed..."
Because the IPCC failed to correctly recognize, identify and publicly state that land-use changes were a primary driver of climate change and temperatures, wealthy individuals like George Soros and Richard Branson have been provided incentives to trash natural forested habitats, to be replaced with money producing bio-fuel agriculture plots (e.g., palm plantations). Now that the IPCC has belatedly recognized the importance of land-use changes on climate, possibly the world's wealthy elites will no longer be able to invest in major natural habitat changing projects. Previous non-CO2 climate impacts and bio-fuel postings. While reviewing the bounty of solar and climate information found at the Global Warming Science site, we found the adjacent chart (this is the 'C3' revised version using annual HadCRUT global temperatures instead of monthly). Clearly, there is a strong relationship between solar activity (magnetic solar flux) and global temperatures. The relationship is not perfect but it represents a significant improvement over the incredibly lame human-CO2 and global warming / climate change relationship claimed by the IPCC's anti-CO2 Climategate scientists and alarmists. "The authors examined measurements of near-earth interplanetary magnetic field to determine the total magnetic flux leaving the sun since 1868...authors were able to show that the total magnetic flux leaving the sun has risen by a factor of 1.41 over the period 1964-1996. Surrogate measurements of the interplanetary magnetic field previous to this time indicate that this parameter has increased by a factor of 2.3 since 1901...results of this study lead us to wonder just how much of the reported 0.6°C global temperature rise of the last century might be a result of the more than two-fold increase in the total magnetic solar flux over that period. We may now, at long last, be moving closer than ever in our effort to understand the importance of the sun in driving 20th century climate change." Previous solar-climate and peer-reviewed postings. Solar/cosmic temperature charts. Read here. The IPCC's climate modelers purposefully designed the computer models to implicate human CO2 emissions as the major culprit for global warming and climate change. As the climatic empirical evidence kept growing though, it became obvious these models were atrocious at climate prediction, specifically due to their myopic reliance on CO2 as the principal global warming forcing. As the majority of scientists are now coming to believe, new research from Humlum et al. determines that indeed human CO2 emissions and other greenhouse gases are not the primary cause of global warming. The peer-reviewed research clearly implicates the climate's natural variability as the driving force of global warming. Read here. Despite the recent BEST climate science fiasco, the BEST team has at least confirmed what everyone on the planet agrees to: the globe has warmed since the Little Ice Age; it warmed at an increase rate during the late 20th century; and, global warming disappeared with a subsequent major deceleration during the 21st century. What the BEST researchers did not determine is the cause of the warming - is temperature variation anthropogenic or natural? A new peer reviewed study in a major physics journal provides the answer to that question. Additional BEST and peer-reviewed postings. Read here. The IPCC climate models almost complete failure at climate prediction has become an embarrassing joke within the general science community as these money-eating simulation efforts starve other science projects of funds. Almost on a weekly basis there is new research revealing the climate model failure fiasco, which likely will remain the case for the foreseeable future, per a recent study. Wan et al. analyzed the Atlantic tropical bias that exists in the major IPCC climate models that prevents the coupled models from accurately reproducing Atlantic equatorial sea surface temperatures. This failure will not be solved in the near future they determine, which precludes these models being able to "predict" abrupt climate change. Additional climate-model, failed-prediction, oscillation-circulation and peer-reviewed postings. Read here. Droughts are a frequent visitor to the southwest U.S. and Mexico regions. The current drought that this area is experiencing is bad but in no way is it as extreme as the droughts that took place during the Medieval era. As the chart reveals, both the Medieval and modern periods share a characteristic of high incoming solar irradiance. With the increase of incoming solar energy, the result is time spans of frequent and more intense droughts. These more extreme droughts occur naturally and have nothing to do with greenhouse gases, including CO2 emissions. There are some scientists who predict we are entering a stage where 60-year droughts, like those during the Medieval Period, could occur but no one knows for sure. If solar irradiance falls (as it seems to be doing most recently), the modern drought cycle may end. Previous drought/flood and peer-reviewed postings. List of severe weather events. Severe weather charts. Read here. While IPCC-biased climate researchers entirely focus efforts on incredibly lame climate models and the AGW CO2-centric hypothesis, other researchers across the globe are conducting groundbreaking research finding new, important impacts on the climate. A new peer-reviewed study on sugarcane by Loarie et al. is an example of such. Specifically, the researchers document how a single land-use change can significantly impact local/regional temperatures, overwhelming the weak CO2-induced global warming impact. Additional non-CO2 climate-impact postings and other peer-reviewed postings. Read here. The 2007 IPCC report went out of its way to diminish the importance of the urban heat island (UHI) effect on global warming. In typical Climategate-style research, the IPCC had to strengthen its case that human CO2 was the primary cause of recent global warming, and the only way to accomplish this was to marginalize and reduce the impact of other factors, including UHI. A Japanese scientist, unconvinced by the unsubstantiated and non-scientific UHI claims of the IPCC, studied the issue further and has determined that the UHI effect, even in sparsely populated areas, is "statistically significant." Additional peer-reviewed and UHI postings. As the monthly empirical evidence keeps pouring in, the AGW hypothesis and climate model simulations that portray atmospheric CO2 levels being the principal driving force behind global temperature change looks weaker and weaker. A growing chorus of scientists worldwide are now saying that the idea that global warming is caused by 'CO2 vapours' is a quaint, 1800's European hypothesis, but severely lacking in any robust, modern empirical evidence. While the CO2-vapours based AGW hypothesis crumbles in the face of actual climate data, other scientific explanations regarding global temperature change are looking stronger and stronger. One such hypothesis is that the Southern Oscillation (SO) accounts for some 80% of global temperature variance. The strength of that explanation appears exceptional when viewing the HadCRUT global temperature change over the last 15 years in comparison to the the Southern Oscillation Index (SOI), in the chart immediately below. The evidence suggests a strong statistical relationship for the SO being the primary driver of temperatures and potential climate change. In comparison, the relationship between CO2 levels and global temperatures is an obvious weak one, almost statistically non-existent, as the chart below depicts. Scientists analyzing the below data are now concluding that although CO2 has some impact on temperatures, this incredibly weak statistical evidence is driving their research towards better, more complete explanations. There are multiple factors that affect both regional and global temperatures, but the most important source of long-term temperature change is solar activity. Using data from the Norwegian Sea and multiple solar proxies, the peer-reviewed research by Sejrup et al. confirms a robust and synchronous correlation between solar activity and temperatures. Note: This research was conducted and completed without the use of magical "hockey stick" science and statistics, perfected by Penn State University personnel. Additional solar, climate-history and peer-reviewed postings. Read here (scroll down to "Nitrous Oxide From Rivers & Streams"). Over the last year, it has become painfully obvious that the IPCC "climate science" has been terribly flawed due to political agendas, resulting in the bogus and inaccurate IPCC climate model simulations. Part of the IPCC agenda is to downplay other contributors to global warming that would detract from the favored, politically correct human CO2 emissions. As another example of the IPCC's scientific fraud incompetence, a recent peer-reviewed study reveals the IPCC's gross underestimation of another potent greenhouse gas: nitrous oxide (N2O). Read here. IPCC and national climate agency climate models have failed spectacularly at predicting the ENSO climate pattern changes that results in major regional weather conditions. A new peer-reviewed study helps expalin why the climate models fail consistently: the under estimation of both the Sun's impact and a powerful negative feedback ('ocean thermostat'). Additional postings: peer-reviewed studies; solar influence; failed climate models; ocean oscillations; and, negative feedback. Read here. French scientists, J.-L. Le Mouël et al., determine that solar activity has major impact on temperatures across the world. Both major global warming and global cooling periods can be attributed to associated solar activity. More peer-reviewed postings. Additional solar postings. Read here. The number of major volcanic eruptions has diminished over the last two decades, resulting in a significantly cleaner stratosphere that allows more solar energy to strike the earth's surface. The net result: at least 50% of modern "global warming" is due to less volcanic activity. "Since 1997, when Pinatubo’s aerosol settled out, the stratosphere has been exceptionally clear.....Half or more of the warming since 1995 may due to the lack of large volcanic eruptions.....That's about 0.13°C.....The remaining climate change is presumably caused by other forces, such as solar variability, El Nino, Atlantic AMO warming in 1995, lower Albedo and maybe even a little greenhouse gas." Read here and here. IPCC climate models and those of major countries are designed to fail with significant predictability. Why? "The scientific community is uncertain about how the effects of clouds will change in the future." Despite this significant model shortcoming affecting all climate models, more empirical evidence is being accumulated by both satellites and climate experts that indicate clouds have a much greater impact on temperatures than CO2 levels in the atmosphere than previously understood. As the graph below indicates, global temperatures appear to be driven by sunlight reaching the earth's surface, as regulated by cloud coverage, not by CO2 increases. This graph is a derivative of satellite data as presented by Dr. Roy Spencer. The case for substantial cloud impact on temperature and climate, both in the short and long terms, is growing as Dr. Spencer continues his research of data being gathered by NOAA satellites. Note: The scaled red NCDC monthly global temperature anomaly curve and the monthly cumulative CO2 increase are superimposed on the satellite reflected sunlight chart. The original satellite chart was flipped vertically so that the maximum sunlight striking the surface measurement would be at the top. Other modern temperature graphs. Additional climate model failure postings. Read here. At one time, the hubris of global warming scientists led them to believe their climate models could explain/predict the future ENSO variations. As usual, Mother Nature made fools of the scientists, so they went back to investigate what they and their models could actually explain/predict about ENSO. End result of peer-reviewed study? "...they state that "it is not yet possible to say whether ENSO activity will be enhanced or damped, or if the frequency of events will change."..... "it is not clear at this stage which way ENSO variability will tip ... As far as we know, it could intensify, weaken, or even undergo little change depending on the balance of changes in the underlying processes."..... "by a team of twelve researchers hailing from six different countries (Australia, France, India, South Korea, the United Kingdom and the United States), wherein they review the findings of what they describe as "a hierarchy of mathematical models [that] have been used to explain the dynamics, energetics, linear stability and nonlinearity of ENSO,""
"The authors write that "the El Niño-Southern Oscillation (ENSO) is a naturally occurring fluctuation," whereby "on a timescale of two to seven years, the eastern equatorial Pacific climate varies between anomalously cold (La Niña) and warm (El Niño) conditions," and that "these swings in temperature are accompanied by changes in the structure of the subsurface ocean, variability in the strength of the equatorial easterly trade winds, shifts in the position of atmospheric convection, and global teleconnection patterns associated with these changes that lead to variations in rainfall and weather patterns in many parts of the world," which end up affecting "ecosystems, agriculture, freshwater supplies, hurricanes and other severe weather events worldwide.""